Finding evidence of termites in your home can be a stressful thing. Whether it be actual termites, or signs of damage you’ll want to immediately contact a pest control specialist. Here’s an overview of what to look for and what will happen when you call your local termite exterminator. There are various types of evidence of termites – termite wings at window openings, actual termites, mud tunnels that appear on exterior or interior walls, buckling wood, wood that appears as if it has been water damaged, and visible mazes within walls are all signs that you might have a termite infestation. Keep your eyes open for all signs. Often times you won’t see anything until a full infestation has invaded your home. A yearly inspection, done by a professional, can often help establish if you have a termite infestation – but these can also come too late – so it’s important that you keep your eye out. When a pest control specialist comes to your house to inspect your home he or she will take a look at all exterior and interior walls, as well as look for any open crevices or cracks along those walls. He or she will use thermometers and other tools to identify any moisture in walls that might attract termites. He or she will also generate a termite inspection report that details any damage or potential damage. You’ll want to review this with your pest control specialist to make sure you don’t have any questions. If termites are found, you’ll also want to discuss what your options are for treatment. If termites are found, a pest control specialist will review your options. The options will depend on what type of termite infestation you have. 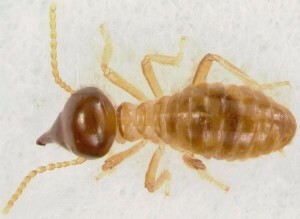 Drywood and Subterranean termites are common to Arizona’s dry and arid landscape. The pest control specialist will also take a look at your home, and base his or her determination on treatment based on what he or she has found.